Robert Righter is the President of Nova Sports USA, Inc manufacturer of premium quality acrylic recreational coatings sold thru a network of builders and distributors worldwide. Rob has also served on the Board of Directors for the American Sports Builders Association and is a former Division President. 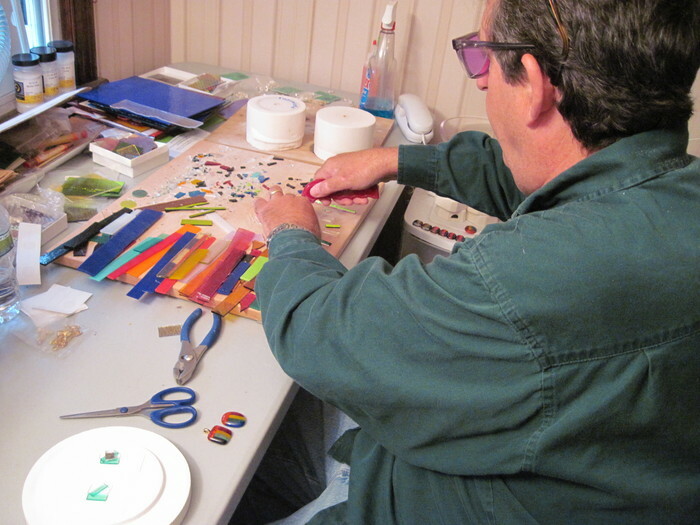 Rob considers his glass pendant business a stress relief and greatly enjoys fusing glass. Rob has been fusing glass since 2008 and still gets excited when he opens the kiln to see his work. Debbi Righter recently retired from banking and enjoys the customer service and sales. Debbi is the contact person for scheduling shows. Above: A batch of pendants before being fired in the kiln. Above: A batch of glass pendants after firing in the kiln. After the first fuse in the kiln, each pendant is ground with a glass grinder and will be fired again (soft fused) to round the edges and give the piece a chunky thickness.